Oliver Twist's famous words, and the gruel he wanted more of, epitomise most people's image of the workhouse and its horrors. Dickens' story - subtitled The Parish Boy's Progress - first appeared in 1837 in the monthly magazine Bentley's Miscellany, although it had probably been evolving in Dickens' mind for several years. Its writing and publication came at a particularly significant point in the history of the workhouse, and of the poor-relief system of which it formed part. With the passing of the 1834 Poor Law Amendment Act, the old parish-based workhouse system was being replaced by a new regime based on the Poor Law Union - typically twenty or thirty parishes centred around a market town. The new system, run by central Poor Law Commission based in Somerset House in London, aimed to standardize poor relief across the country. The workhouse portrayed by Dickens comes at the exact transition between the two eras presents a rather muddled mixture of the two. The Beadle for example, was a parish official or constable who had no role in the union workhouse system. The system of 'farming out' young children to the countryside was peculiar to London workhouses, yet we learn that Oliver's workhouse was some seventy miles from the capital. Most significantly, Oliver, having reached the age of nine, would have been entitled to the same rations as an adult woman which would have added at least a portion of bread to his meal. 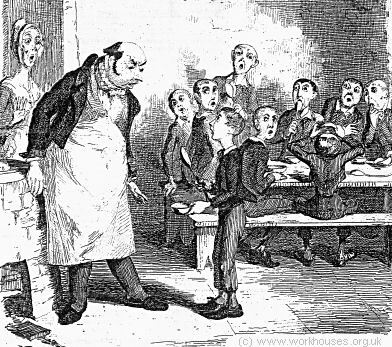 Interestingly, Dickens' later journalistic writings about the workhouse, for example, A Walk in a Workhouse in 1850, give a much more positive view of workhouses than that presented in Oliver Twist. Everybody knows the story of another experimental philosopher who had a great theory about a horse being able to live without eating, and who demonstrated it so well, that he had got his own horse down to a straw a day, and would unquestionably have rendered him a very spirited and rampacious animal on nothing at all, if he had not died, four-and-twenty hours before he was to have had his first comfortable bait of air. Unfortunately for, the experimenal philosophy of the female to whose protecting care Oliver Twist was delivered over, a similar result usually attended the operation of HER system; for at the very moment when the child had contrived to exist upon the smallest possible portion of the weakest possible food, it did perversely happen in eight and a half cases out of ten, either that it sickened from want and cold, or fell into the fire from neglect, or got half-smothered by accident; in any one of which cases, the miserable little being was usually summoned into another world, and there gathered to the fathers it had never known in this. Occasionally, when there was some more than usually interesting inquest upon a parish child who had been overlooked in turning up a bedstead, or inadvertently scalded to death when there happened to be a washing—though the latter accident was very scarce, anything approaching to a washing being of rare occurance in the farm—the jury would take it into their heads to ask troublesome questions, or the parishioners would rebelliously affix their signatures to a remonstrance. But these impertinences were speedily checked by the evidence of the surgeon, and the testimony of the beadle; the former of whom had always opened the body and found nothing inside (which was very probable indeed), and the latter of whom invariably swore whatever the parish wanted; which was very self-devotional. Besides, the board made periodical pilgrimages to the farm, and always sent the beadle the day before, to say they were going. The children were neat and clean to behold, when THEY went; and what more would the people have! It cannot be expected that this system of farming would produce any very extraordinary or luxuriant crop. Oliver Twist's ninth birthday found him a pale thin child, somewhat diminutive in stature, and decidely small in circumference. But nature or inheritance had implanted a good sturdy spirit in Oliver's breast. It had had plenty of room to expand, thanks to the spare diet of the establishment; and perhaps to this circumstance may be attributed his having any ninth birth-day at all. Be this as it may, however, it was his ninth birthday; and he was keeping it in the coal-cellar with a select party of two other young gentleman, who, after participating with him in a sound thrashing, had been locked up for atrociously presuming to be hungry, when Mrs. Mann, the good lady of the house, was unexpectedly startled by the apparition of Mr. Bumble, the beadle, striving to undo the wicket of the garden-gate. Mrs. Mann ushered the beadle into a small parlour with a brick floor; placed a seat for him; and officiously deposited his cocked hat and can on the table before him. Mr. Bumble wiped from his forehead the perspiration which his walk had engendered, glanced complacently at the cocked hat, and smiled. Yes, he smiled. Beadles are but men: and Mr. Bumble smiled. 'Do you give the children Daffy, Mrs. Mann?' inquired Bumble, following with this eyes the interesting process of mixing. The members of this board were very sage, deep, philosophical men; and when they came to turn their attention to the workhouse, they found out at once, what ordinary folks would nver have discovered—the poor people liked it! It was a regular place of public entertainment for the poorer classes; a tavern where there was nothing to pay; a public breakfast, dinner, tea, and supper all the year round; a brick and mortar elysium, where it was all play and no work. 'Oho!' said the board, looking very knowing; 'we are the fellows to set this to rights; we'll stop it all, in no time.' So, they established the rule, that all poor people should have the alternative (for they would compel nobody, not they), of being starved by a gradual process in the house, or by a quick one out of it. With this view, they contracted with the water-works to lay on an unlimited supply of water; and with a corn-factor to supply periodically small quantities of oatmeal; and issued three meals of thin gruel a day, with an onion twice a week, and half a roll of Sundays. They made a great many other wise and humane regulations, having reference to the ladies, which it is not necessary to repeat; kindly undertook to divorce poor married people, in consequence of the great expense of a suit in Doctors' Commons; and, instead of compelling a man to support his family, as they had theretofore done, took his family away from him, and made him a bachelor! There is no saying how many applicants for relief, under these last two heads, might have started up in all classes of society, if it had not been coupled with the workhouse; but the board were long-headed men, and had provided for this difficulty. The relief was inseparable from the workhouse and the gruel; and that frightened people.